In testing, I found that memory gives marginal returns on gaming loads so instead I focused on numeric processing/integer tests such as SuperPi and 7Zip compression tests to better differentiate performance gains. Here using AIDA we see that the 3600 as expected delivers some quite decent results and we even included some overclocked and tighter timing results in here for comparison. as you can see Simply leaving speed alone but tightening up the primary timings gave us a quick easy performance boost, but the overclock of the frequency gave us eth largest gains. However, do keep in mind that these gains don’t always translate to the best performance as you will see below. SuperPi is a very popular program for testing single threaded performance by calculating digits of Pi. You run it by setting the length of the test and the score is time-based at the end. Performance is judged by how quickly it can complete the task you assign. SuperPi is great for demonstrating efficiency down to a quite finite level. It is not infallible or perfect but its a good way any of you could compare numbers. 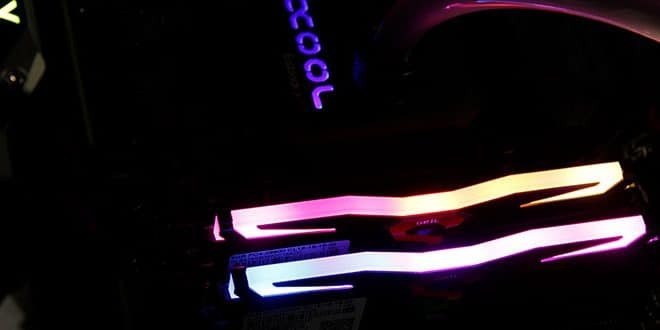 Here we see that the GeIL Super Luce RGB kit at XMP 3600MHz settings falls a little behind the 3200MHz kit from Corsair. This would be attributed to tighter overall profile from corsair especially with some of the non-primary timings. When tweaking the Super Luce we found that at 4000MHz at XMP timings we matched the 3200 Vengeance. however, leaving the speed at 3600MHz and tightening up the primaries definitely gave us a far better result shaving almost a full 10 seconds off of the run. WPrime is very similar to SuperPi but is a multithreaded program which you can assign the number of threads that work on the problem and you get a time-based result on how long it took for the CPU to crunch through the task you assign. WPrime being a heavily thread dependent app sees little differentiation and more heavily leans on the CPU. 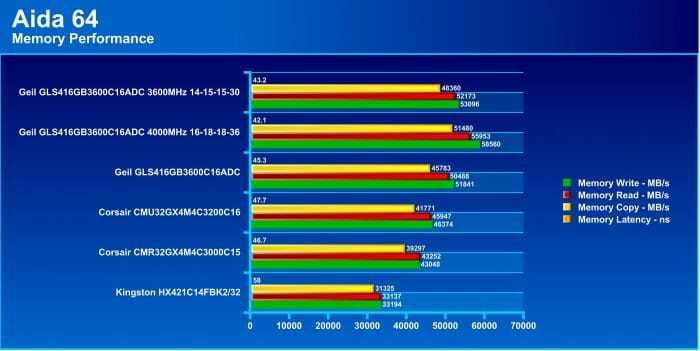 This proves to be a good test for comparing CPUs but shows that in heavily threaded tasks like this the memory efficiency comes secondary which is why many workstations run JEDEC kits as they prefer stability for their heavy threaded workloads. 7-Zip is a free open source file compression utility and also a good way to show your PC’s capability to perform compression tasks. 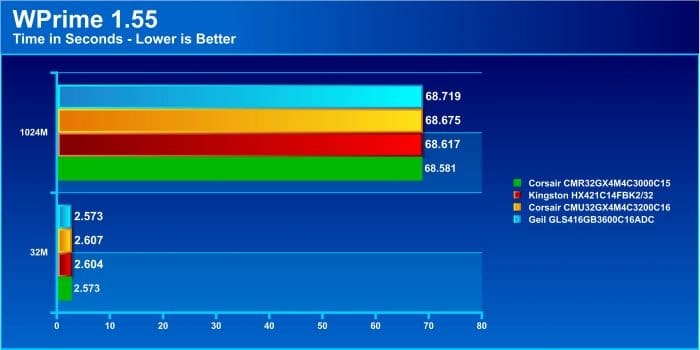 The 7Zip test shows that with compression tasks you can see some serious benefits from higher performance memory. 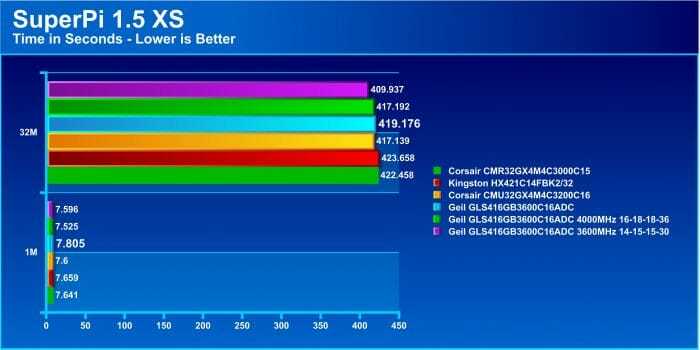 the GeIL kit with the same B-Die IC’s as the Corsair Vengeance 3200 kit easily opens a decent lead ahead of its competition, proving why I run more tests than SuperPi. sometimes a certain configuration will net benefits form a specific workload. Now that we see what the memory can do and even how it performs overclocked, let’s take a look at the dive into overclocking.